Zucchini is such a versatile vegetable. 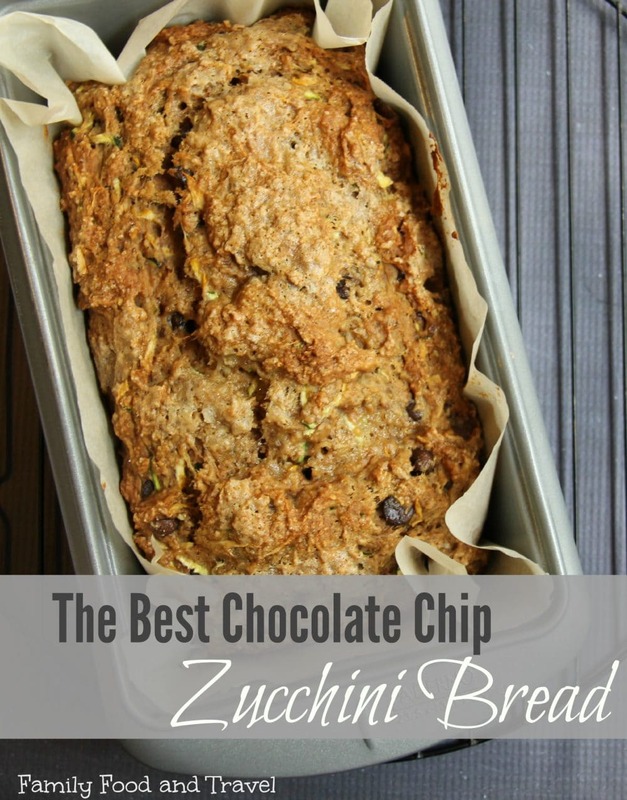 We love it grilled, in soups and quiche and grated into pancakes but the absolute best way to eat it is in this Chocolate Chip Zucchini Bread recipe. Moist, delicious and packed full of nutrients this zucchini bread recipe is a modified from Skinnytaste.com one of my favourite sites for delicious low fat recipes. 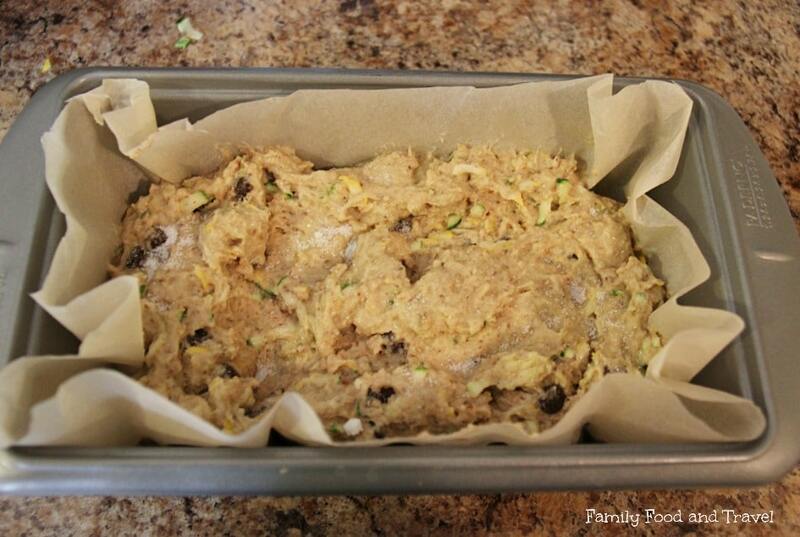 My version of Chocolate Chip Zucchini Bread has flax, a hint of cinnamon and a light sugar topping. A family favourite through the summer and into the Fall when our local CSA farm share delivers more zucchini than we can grill! 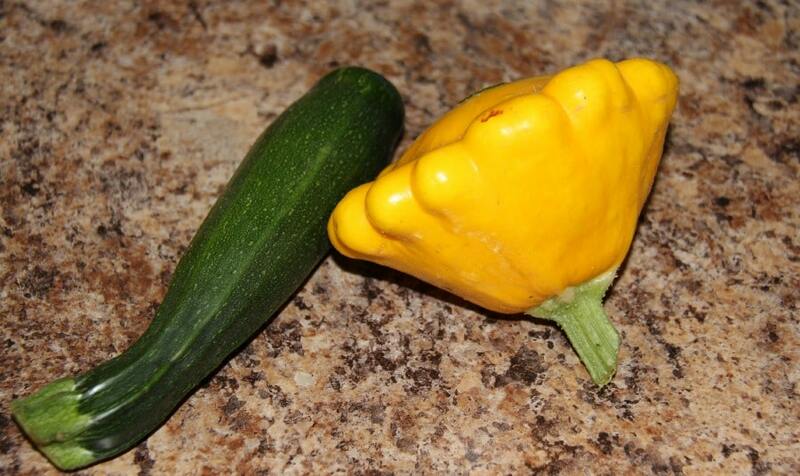 For this recipe I used a tiny zucchini and a larger summer squash giving it green and yellow colouring. The variety of dry ingredients give the bread a complex taste. 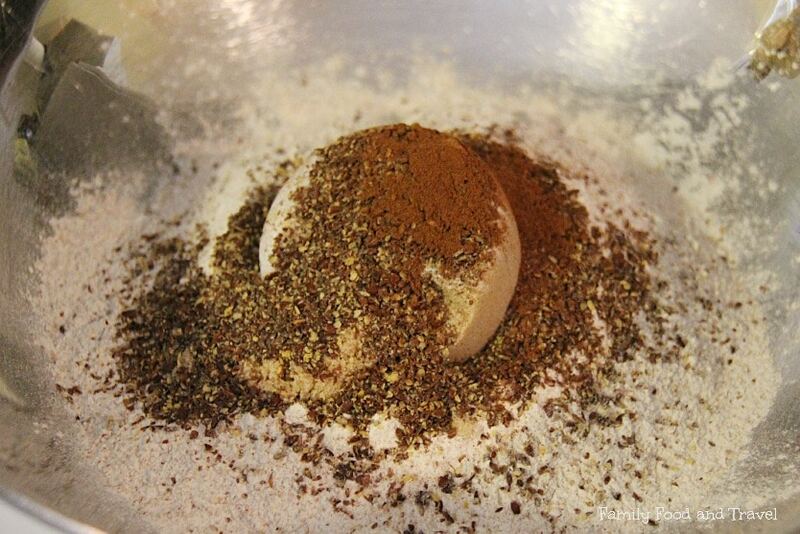 The mixture will be very thick and moist – this is what allows it to be so delicious when cooked. Adding any more flour would result in a dry bread. 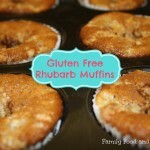 This recipe also makes great muffins – the perfect back to school lunch box treat! Check out these other fabulous zucchini recipes Zucchini Tomato and Potato Casserole, Zucchini Lasagna, and Cheesy Zucchini Bake. This sounds delicious! I love that m kids wouldn’t realize that this was veggie-based. That yellow squash looks gorgeous, btw. can I leave out the flax? can I use all AP flour and not use wheat flour? Yes, you absolutely can. I have removed the flax and it’s just as good. 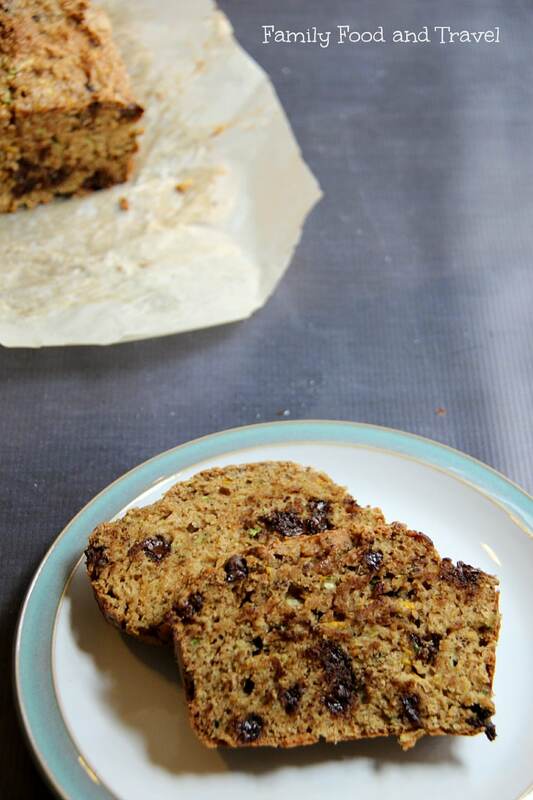 If you only use All Purpose flour it will be more like cake than bread – which will probably be delicious! Consequently delectable! That appears irresistible! I’m definitely liking the chocolate chips. :) And no one needs to know about the zucchini inside. 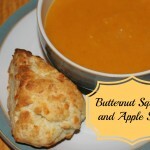 :P I hope you can stop on by and share this or any other recipe with us on Five Friday Finds! awesome, pinned this for later! Oh boy, this sounds fantastic. I must try it. 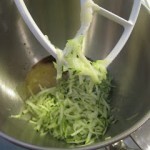 I like adding shredded zucchini to things to bring up the nutritional value of a recipe. I like adding ground flax too. Thank you so much for linking up to Tips and Tricks. We hope you will visit again. 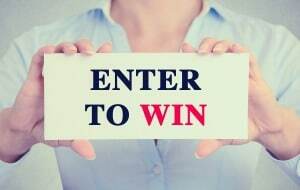 Kathleen recently posted..Table Coasters and a Giveaway! Looks and sounds very good, I can sneak some zucchini into my family with this recipe!!! Thank you so much for the recipe. It was delicious! Just wondering if the oven temp should actually be 325F. I have a fairly new over (2 years old) and found that I need to cook it a lot longer and increase the temp to 375. Just curious! Carole recently posted..I’m on top of this blog ….. ! I cook mine at 325F in a metal pan. Sometimes I have to cook an additional 10 mins, but feel free to adjust your temp to your stove. Thank you for the note. I will double check my cook time when I make another loaf this week. So glad you liked this recipe. It’s our family’s favourite! I know I would love this–maybe with some sweet butter slathered om it! What a great way to add veggies to a dessert! I don’t think I’ve ever had chocolate chip zucchini bread. It looks good. It is honestly fantastic! You’ll love it! I love zucchini bread and chocolate. I will have to try this recipe. My grandma used to make this all the time. Thanks for sharing. Zucchini Bread is so great. Its moist and flavorful. Adding chocolate chips will make it s much more yummy. Wonderful ! I’ve been looking to try a new zucchini bread recipe that my grandkids would enjoy ! Thanks for sharing ! 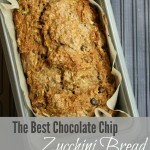 I’ve actually never thought of putting zucchini in chocolate chip bread. This looks so good, I will definitely try it. Thank you for the recipe. 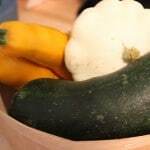 Must try this recipe after the zucchini harvest from our garden this summer. This truly seems to be a bread I can enjoy daily for sure.